The Battle of Gallipoli took place at Gallipoli from April 1915 to December 1915, during the First World War. A joint Imperial British and French operation was mounted to capture the Ottoman capital of Istanbul and provide a secure sea route for military and agricultural trade with the Russians. The attempt failed, with heavy casualties on both sides. In Turkey, the campaign is known as the Çanakkale Savaşları, after the province of Çanakkale. In the United Kingdom, it is called the Dardanelles Campaign or Gallipoli. In France it is called Les Dardanelles. In Australia, New Zealand, and Newfoundland it is known as the Gallipoli Campaign, or simply as Gallipoli. The Battle of Gallipoli resonated profoundly among all nations involved. To this day, ANZAC (Australian and New Zealand Army Corps) Day is commemorated in Australia and New Zealand, the battle often considered to mark the birth of the national consciousness of each nation, replacing their formerly collective identity under the British Empire. In Turkey, the battle is perceived as a defining moment in the history of the Turkish people—a final surge in the defense of the motherland as the centuries-old Ottoman Empire was crumbling. The struggle laid the grounds for the Turkish War of Independence, in which its leaders distanced the Turkish nation from the Ottomans, blaming the latter for Turkish involvement in the war. Victory in the Dardenelles helped to inspire the creation of the Turkish Republic eight years later under Atatürk, himself a commander at Gallipoli. The Allies struggled throughout the war to open an effective supply route to Russia. The German Empire and Austria-Hungary blocked Russia's land trade routes to Europe, while no easy sea route existed. The White Sea in the north and the Sea of Okhotsk in the Far East were distant from the Eastern Front and often icebound. The Baltic Sea was blocked by Germany's formidable Kaiserliche Marine. The Black Sea's only entrance was through the Bosphorus, which was controlled by the Ottoman Empire. When the Ottoman Empire joined the Central Powers in October 1914, Russia could no longer be supplied from the Mediterranean Sea. By late 1914, the Western Front, in France and Belgium, had effectively become fixed. A new front was desperately needed. Also, the Allies hoped that an attack on the Ottomans would draw Bulgaria and Greece into the war on the Allied side. However, an early proposal to use Greek troops to invade the Gallipoli peninsula was vetoed by Russia as its south slavic allies would feel threatened by an expansion of Greek power and influence. A first proposal to attack Turkey had already been suggested by French Minister of Justice Aristide Briand in November 1914, but it was not supported. A suggestion by British Naval Intelligence (Room 39) to bribe the Turks over to the Allied side was not taken up. Later in November, First Lord of the Admiralty Winston Churchill put forward his first plans for a naval attack on the Dardanelles, based at least in part on what turned out to be erroneous reports regarding Turkish troop strength, as prepared by Lt. T.E. Lawrence. He reasoned that the Royal Navy had a large number of obsolete battleships which could not be used against the German High Seas Fleet in the North Sea, but which might well be made useful in another theater. Initially, the attack was to be made by the Royal Navy alone, with only token forces from the army being required for routine occupation tasks. On February 19, the first attack on the Dardanelles began when a strong Anglo-French task force, including the British battleship HMS Queen Elizabeth, bombarded Turkish artillery along the coast. A new attack was launched on March 18, targeted at the narrowest point of the Dardanelles where the straits are just a mile wide. A massive fleet under the command of Admiral de Robeck containing no fewer than 16 battleships tried to advance through the Dardanelles. However almost every ship was damaged by sea mines which were laid along the Asian shore by the Turkish minelayer, Nusrat. Trawlermen had been used by the British as minesweepers. However they retreated as the Turks opened fire on them, leaving the minefields intact. Soon afterwards three battleships were sunk (HMS Ocean and HMS Irresistible and the French Bouvet), while the battlecruiser HMS Inflexible and the French battleships Suffren and Gaulois were badly damaged. These losses prompted the Allies to cease any further attempts to force the straits by naval power alone. The defeat of the British fleet had also given the Turks a morale boost. The Turkish gunners had almost run out of ammunition before the British fleet retreated. The results of this decision to turn back are unclear—if the British had pushed forward with the naval attack, as Churchill suggested, then Gallipoli might not have been so great a defeat. On the other hand, it is possible that they would simply have trapped themselves in the Sea of Marmara, with force insufficient to take Constantinople and a minefield between themselves and the Mediterranean Sea. After the failure of the naval attacks, it was decided that ground forces were necessary to eliminate the Turkish mobile artillery. This would allow minesweepers to clear the waters for the larger vessels. The British Secretary of State for War, Lord Kitchener, appointed General Sir Ian Hamilton to command the Mediterranean Expeditionary Force that was to carry out the mission. In early 1915, Australian and New Zealand volunteer soldiers were encamped in Egypt, undergoing training prior to being sent to France. The infantry were formed into the Australian and New Zealand Army Corps (ANZAC), which comprised the Australian 1st Division and the New Zealand and Australian Division. General Hamilton also had the regular British 29th Division, the British 10th Division from Kitchener's New Army, the Royal Naval Division (RND) (Royal Marines and hastily drafted naval recruits), and the French Oriental Expeditionary Corps (including four Senegalese battalions) under his command. There was a delay of over six weeks before many of the troops arrived from Britain. This gave the Turkish forces time to prepare for a land assault. There was little security or secrecy in Egypt, and the intended destination of Hamilton's force was widely known. The Turks quickly replenished their stocks of ammunition and other supplies. Disposition of Turkish 5th Army. Hamilton's invasion force was opposed by the Fifth Army, under the command of the German adviser to the Ottoman Army, General Otto Liman von Sanders. The Fifth Army, which had to defend both shores of the Dardanelles, comprised six of the best Turkish divisions totaling 84,000 men. At Bulair, near the neck of the peninsula, were the Turkish 5th and 7th divisions. At Cape Helles, on the tip of the peninsula, and along the Aegean coast, was the Ninth Division and, in reserve at Gaba Tepe in the middle of the peninsula was the 19th Division, under the command of Mustafa Kemal. Defending the Asian shore at Kum Kale, which lies at the entrance to the Dardanelles, were the 3rd and 11th division. 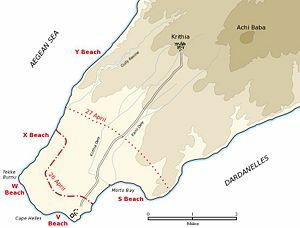 The invasion plan of April 25, 1915, was for the 29th Division to land at Helles on the tip of the peninsula and then advance upon the forts at Kilitbahir. The Anzacs were to land north of Gaba Tepe on the Aegean coast from where they could advance across the peninsula and prevent retreat from or reinforcement of Kilitbahir. The French made a diversionary landing at Kum Kale on the Asian shore. There was also a one-man diversion by Bernard Freyberg of the RND at Bulair. The Helles landing was made by the 29th Division under the command of Major-General Aylmer Hunter-Weston, on five beaches in an arc about the tip of the peninsula, designated from east to west as S, V, W, X, and Y beach. The commander of the Y Beach landing was able to walk unopposed to within 500 meters of Krithia village, which was deserted. The British never got so close again. Y Beach was eventually evacuated the following day, as Turkish reinforcements arrived. At V Beach, the covering force from the Royal Munster Fusiliers and Royal Hampshires was landed from a converted collier, SS River Clyde, which was run aground beneath the fortress so that the troops could disembark directly via ramps to the shore. The Royal Dublin Fusiliers would land at V Beach from open boats. At W Beach the Lancashire Fusiliers also landed in open boats on a small beach overlooked by dunes and obstructed with barbed wire. On both beaches, the Turkish defenders were in a position to inflict appalling casualties on the landing infantry. The troops emerging one by one from the sally ports on the River Clyde presented perfect targets to the machine guns in the Seddülbahir fort. Out of the first 200 soldiers to disembark, only 21 men made it onto the beach. As at Anzac, the Turkish defenders were too few to force the British off the beach. At W Beach, thereafter known as Lancashire Landing, the Lancashires were able to overwhelm the defences despite their dreadful losses, 600 killed or wounded out of a total strength of 1000. The battalions that landed at V Beach suffered about 70 percent casualties. Six awards of the Victoria Cross were made amongst the Lancashires at W Beach. Six Victoria Crosses were also awarded amongst the infantry and sailors at the V Beach landing and a further three were awarded the following day as they finally fought their way off the beach. After the landings, there were so few of the Dublin Fusiliers and Munster Fusiliers left that they were amalgamated into one unit, "The Dubsters." Only one Dubliner officer survived the landing; overall, of the 1,012 Dubliners who landed, only 11 would survive the entire Gallipoli campaign unscathed. Anzac, the landing 1915 by George Lambert, 1922 shows the landing at Anzac Cove, April 25, 1915. On the afternoon of April 27, Kemal launched a concerted attack to drive the Anzacs back to the beach. With the support of naval gunfire, the Turks were held off throughout the night. On April 28, the British, now supported by the French on the right of the line, intended to capture Krithia in what became known as the First Battle of Krithia. The plan of attack was overly complex and poorly communicated to the commanders in the field. The troops of the 29th Division were still exhausted and unnerved by the battle for the beaches and for Seddülbahir village, captured after heavy fighting on the 26th. The attack ground to a halt around 6 p.m. with a gain of some ground but the objective of Krithia village was not reached. After the battle, the Allied trenches lay about halfway between the Helles headland and Krithia village. With Turkish opposition stiffening by the day, the opportunity for the anticipated swift victory on the peninsula was disappearing. Helles, like Anzac, became a siege. Strong Turkish counter-attacks on the nights of May 1 and May 3 were repulsed despite breaking through the French defenses. The first attempt at an offensive at Anzac took place on the evening of May 2, when New Zealand and Australian Division commander, General Godley, ordered the Australian 4th Infantry Brigade, commanded by General John Monash, and the New Zealand Infantry Brigade, to attack from Russell's Top and Quinn's Post towards Baby 700. The troops advanced a short distance during the night and tried to dig in to hold their gains but were forced to retreat by the night of 3 May, having suffered about 1,000 casualties. Believing Anzac to be secure, Hamilton moved two brigades, the Australian Second Infantry Brigade and the New Zealand Infantry Brigade, to the Helles front as reserves for the Second Battle of Krithia starting on May 6. This was the first major assault at Helles and gained about a quarter of a mile on a wide front at the now customary enormous cost in casualties. The Turks launched a major assault at Anzac on May 19—42,000 Turks attacked 17,000 Australians and New Zealanders—but the attack miscarried. Lacking sufficient artillery and ammunition, the Turks relied on surprise and weight of numbers for success but their preparations were detected and the defenders were ready. When it was over, the Turks had suffered about 10,000 casualties. In comparison, the Australian casualties were a mere 160 killed and 468 wounded. The Turkish losses were so severe that a truce was organized for May 24, in order to bury the large numbers of dead lying in no man's land. The Sphinx, one of the battlefield's most distinctive physical landmarks. In May, the British naval artillery advantage was diminished following the torpedoing of the battleships HMS Goliath on May 13, HMS Triumph on May 25, and HMS Majestic on May 27. After these losses, much of the battleship support was withdrawn and those remaining would fire while under way, reducing their accuracy and effectiveness. In the Third Battle of Krithia on June 4, all thought of a decisive breakthrough was gone and the plans for battle had reverted to trench warfare with objectives being measured in hundreds of meters. Casualties ran to around 25 percent for both sides; the British suffering 4,500 from an attacking force of 20,000. 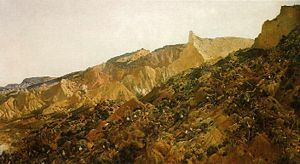 In June, a fresh division, the 52nd Division, began to land at Helles in time to participate in the last of the major Helles battles, the Battle of Gully Ravine which was launched on June 28. This battle advanced the British line along the left (Aegean) flank of the battlefield which resulted in a rare but limited victory for the Allies. 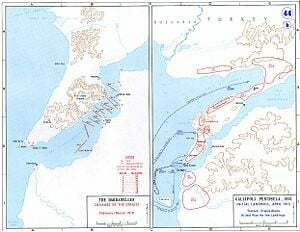 Between July 1 and 5, the Turks launched a series of desperate counter-attacks against the new British line but failed to regain the lost ground. Their casualties for the period were horrendous, estimated at in excess of 14,000. One final British action was made at Helles on July 12, before the Allied main effort was shifted north to Anzac. Two fresh brigades from the 52nd Division were thrown into an attack in the centre of the line along Achi Baba Nullah (known as Bloody Valley) and sustained 30 percent casualties without making any significant progress. A trench at Lone Pine after the battle, showing Australian and Turkish dead on the parapet. The repeated failure of the Allies to capture Krithia or make any progress on the Helles front led Hamilton to pursue a new plan for the campaign which resulted in what is now called the Battle of Sari Bair. On the night of August 6, a fresh landing of two infantry divisions was to be made at Suvla, five miles north of Anzac. Meanwhile at Anzac a strong assault would be made on the Sari Bair range by breaking out into the rough and thinly defended terrain north of the Anzac perimeter. The landing at Suvla Bay was only lightly opposed but the British commander, Lieutenant-General Sir Frederick Stopford, had so diluted his early objectives that little more than the beach was seized. Once again, the Turks were able to win the race for the high ground of the Anafarta Hills thereby rendering the Suvla front another case of static trench warfare. The offensive was preceded on the evening of August 6, by diversionary assaults at Helles and Anzac. At Helles, the diversion at Krithia Vineyard became another futile battle with no gains and heavy casualties for both sides. At Anzac, an attack on the Turkish trenches at Lone Pine by the infantry brigades of the Australian 1st Division was a rare victory for the Anzacs. However, the main assault aimed at the peaks of Chunuk Bair and Hill 971 was less successful. The force striking for the nearer peak of Chunuk Bair comprised the New Zealand Infantry Brigade. It came within 500 meters of the peak by dawn on August 7, but was not able to seize the summit until the following morning. This delay had fatal consequences for another supporting attack on the morning of August 7; that of the Australian 3rd Light Horse Brigade at the Nek which was to coincide with the New Zealanders attacking back down from Chunuk Bair against the rear of the Turkish defenses. The New Zealanders held out on Chunuk Bair for two days before relief was provided by two New Army battalions from the Wiltshire and Loyal North Lancashire Regiments. A massive Turkish counter-attack, led in person by Mustafa Kemal, swept these two battalions from the heights. Of the 760 men of the New Zealanders' Wellington Battalion who reached the summit, 711 were casualties. Another planned attack on Hill 971 never took place. The attacking force of the Australian 4th Infantry Brigade (General Monash), and an Indian Brigade, were defeated by the terrain and became lost during the night. All subsequent attempts to resume the attack were easily repulsed by the Turkish defenders at great cost to the Allies. The Suvla landing was reinforced by the arrival of the British 53rd and 54th Divisions plus the dismounted yeomanry of the 2nd Mounted Division. The unfortunate 29th Division was also shifted from Helles to Suvla for one more push. The final British attempt to resuscitate the offensive came on August 21, with attacks at Scimitar Hill and Hill 60. Control of these hills would have united the Anzac and Suvla fronts, but neither battle achieved success. When fighting at Hill 60 ceased on August 29, the battle for the Sari Bair heights, and indeed the battle for the peninsula, was effectively over. 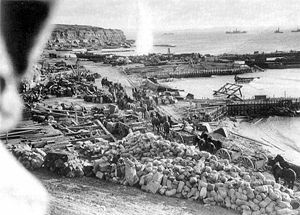 W Beach, Helles, on January 7, 1916, just prior to the final evacuation. Following the failure of the August Offensive, the Gallipoli campaign entered a hiatus while the future direction was debated. The persistent lack of progress was finally making an impression in the United Kingdom as contrasting news of the true nature of the campaign was smuggled out by journalists like Keith Murdoch and Ellis Ashmead-Bartlett, discrediting Hamilton's performance. Disaffected senior officers such as General Stopford also contributed to the general air of gloom. The prospect of evacuation was raised on October 11, 1915, but Hamilton resisted the suggestion, fearing the damage to British prestige. He was dismissed as commander shortly afterwards and replaced by Lieutenant-General Sir Charles Monro. The situation was complicated by the entry of Bulgaria into the war on the side of the Central Powers. On October 5, 1915, the British opened a second Mediterranean front at Salonika which would compete for reinforcements with Gallipoli. Also Germany would now have a direct land route to Turkey, enabling it to supply heavy siege artillery which would devastate the Allied trench network, especially on the confined front at Anzac. Having reviewed the state of his command, Monro recommended evacuation. Kitchener disliked the notion of evacuating the peninsula and made a personal visit to consult with the commanders of the three corps; VIII Corps at Helles, IX Corps at Suvla, and ANZAC. The decision to evacuate was made. Evacuation of 14 divisions in winter in proximity to the enemy would be difficult and heavy losses were expected. The untenable nature of the Allied position was made apparent when a heavy storm struck on November 27, 1915, and lasted for three days. There followed a blizzard at Suvla in early December. The rain flooded trenches, drowning soldiers and washing unburied corpses into the lines. The following snow killed more men from exposure. Ironically, the evacuation was the greatest Allied success of the campaign. Suvla and Anzac were to be evacuated in late December, the last troops leaving before dawn on December 20, 1915. Troop numbers had been progressively reduced since December 7, 1915, and cunning ruses were performed to fool the Turks and prevent them discovering that the Allies were departing. 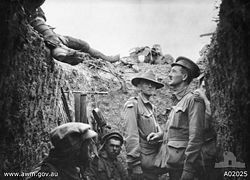 At Anzac, the troops would maintain utter silence for an hour or more until the curious Turks would venture out to inspect the trenches, whereupon the Anzacs would open fire. As the numbers in the trenches were thinned, rifles were rigged to fire by water dripped into a pan attached to the trigger. Helles was retained in case the British wanted to resume the offensive. However, a decision to evacuate there too was made on December 27. The Turks were now warned of the likelihood of evacuation and mounted an attack on January 6, 1916, but were repulsed. The last British troops departed from Lancashire Landing on January 9, 1916. [[Image:Attaturkswords5.jpg|thumb|200px|Memorial of Anzac Cove; commemorating the loss of thousands of Turkish and Anzac soldiers in Gallipoli. Those heroes that shed their blood and lost their lives… you are now lying in the soil of a friendly country. Therefore rest in peace. There is no difference between the Johnnies and the Mehmets where they lie side by side here in this country of ours… You the mothers who sent their sons from far away countries, wipe away your tears. Your sons are now lying in our bosom and are in peace. Having lost their lives on this land they have become our sons as well (Mustafa Kemal). The Ottoman Empire had been dismissed by Tsar Nicholas I of Russia as "the sick man of Europe" but after victory over the Allies at Gallipoli, Turkey's visions of the empire were renewed. In Mesopotamia, the Turks surrounded a British expedition at Kut Al Amara, forcing their surrender in 1916. From southern Palestine, the Turks pushed into the Sinai with the aim of capturing the Suez Canal and driving the British from Egypt. Defeat at the Battle of Romani marked the end of that ambition and for the remainder of the war, the British were on the offensive in the Middle East. After the evacuation, the Allied troops reformed in Egypt. The Anzacs underwent a major reorganization; the infantry were expanded and bound for the Western Front, the light horse were reunited with their horses and formed into mounted divisions for operations in the Sinai and Palestine. At the Battle of Beersheba, they would finally achieve the decisive break-through victory that had eluded the Allies on Gallipoli. Amongst the generals, Gallipoli marked the end for Hamilton and Stopford but Hunter-Weston was granted another opportunity to lead the VIII Corps on the first day of the Battle of the Somme. The competence of Australian brigade commanders, John Monash and Henry Chauvel, would be recognized with promotion to the command of divisions and ultimately corps. Lord Kitchener was too popular to be punished, but he never recovered his old reputation for invincibility and was increasingly sidelined by his colleagues until his death the following year. On the Turkish side, the meteoric rise of Mustafa Kemal began at Gallipoli. The failure of the landings had significant repercussions in the UK, which began even as the battle was still in progress. The First Sea Lord, John Fisher resigned in May after bitter conflict with Winston Churchill over the campaign. The crisis that followed forced the Prime Minister, Herbert Asquith, to end his single-party Liberal Government and form a Coalition Government with the Conservative Party. Churchill was demoted from First Lord of the Admiralty as a prerequisite for Conservative entry to the coalition; although retained in the Cabinet, he was given the sinecure job of Chancellor of the Duchy of Lancaster, from which he resigned at the end of 1915, departing for the Western Front where he commanded an infantry battalion early in 1916. Asquith was partly blamed for Gallipoli and other disasters, and was overthrown in December 1916, when David Lloyd George successfully split the Liberal Party in two. Lloyd George formed a new government, in which Churchill, active in the House of Commons again in late 1916, was not offered a place; he was eventually appointed Minister of Munitions in the middle of 1917, although he was not a member of the small War Cabinet and no longer had the influence over war strategy which he had earlier enjoyed. The Dardanelles Commission was established in 1916, to investigate the failure of the expedition. Its final report was issued in 1919, concluding that the adventure had been badly planned and difficulties underestimated, and that government had exacerbated problems through its procrastination. However, its censures did not damage careers measurably further than they already had been. Some people, such as Winston Churchill, have also argued that the landings may have helped accelerate the alleged genocide of the Armenian population in the Ottoman Empire during 1915. The conditions endured by both sides at the battle of Gallipoli have also acquired a notoriety. In the summer, the heat was reportedly atrocious, and in conjunction with bad sanitation it led to flies flourishing, to the extent that eating became extremely difficult. Corpses left in the open became bloated and caused a tremendous stench. The precarious bases upon which the Allies were situated also caused supply and shelter problems. A dysentery epidemic spread through the Allied trenches in both Anzac and Helles. Though the onset of Winter and Autumn brought relief from the heat, it also led to gales, flooding, and several cases of frostbite. In addition to soldiers killed in action, those who died of wounds, and those wounded listed in the table to the right, many soldiers became sick in the unsanitary environment of the peninsula, mainly from enteric fever, dysentery, and diarrhea. It is estimated that a further 145,000 British soldiers became casualties from illness during the campaign. Amongst the dead of the battle was the brilliant young physicist Henry Moseley. Also the poet Rupert Brooke, serving with the Royal Naval Division, died shortly before the invasion from a septic mosquito bite. No chemical weapons were used at Gallipoli, although they were used against Ottoman troops in the Middle Eastern theater two years later, during the second and third battles of Gaza in 1917. There were allegations that Allied forces had attacked or bombarded Turkish hospitals and hospital ships on several occasions between the start of the campaign and September 1915. By July 1915, there were 25 Ottoman hospitals with a total of 10,700 beds, and three hospital ships in the area. The French Government disputed these complaints (made through the Red Cross during the war), and the British response was that if it happened then it was accidental. Russia, in turn, claimed that the Turks had attacked two of their hospital ships, Portugal and Vperiod, and the Ottoman Government responded that the vessels had been the victims of naval mines. The Commonwealth War Graves Commission (CWGC) is responsible for developing and maintaining permanent cemeteries for all Commonwealth forces—United Kingdom, Australia, New Zealand, India, Newfoundland and others. There are 31 CWGC cemeteries on the Gallipoli peninsula: Six at Helles (plus the only solitary grave), four at Suvla, and 21 at Anzac. For many of those killed, and those who died on hospital ships and were buried at sea, there is no known grave. These men's names are each recorded on one of five "memorials to the missing;" the Lone Pine memorial commemorates Australians killed in the Anzac sector; whilst the Hill 60 and Chunuk Bair Memorials commemorate New Zealanders killed at Anzac. The Twelve Tree Copse Memorial commemorates the New Zealanders killed in the Helles sector, and British and other troops (including Indian and Australian) who died in the Helles sector are commemorated on the memorial at Cape Helles. British naval casualties who were lost at sea, or buried at sea, are not recorded on these memorials, instead they are listed on memorials in the United Kingdom. There is only one French cemetery on the Gallipoli peninsula, located near Soroz Beach, which was the French base for the duration of the campaign. There are 2 more CWGC cemeteries on the Greek island of Limnos. The first on the town of Moudros and the second on the Portianou village. Limnos was the hospital base for the allied forces and most of the buried were among the wounded who didn't survive. On the Portianou village, CWGC cemetery lies a grave with the name R.J.M. Mosley on it but it is rather unlikely to be the known physicist Henry Moseley. There are no large Turkish military cemeteries on the peninsula, but there are numerous memorials, the main ones being the Çanakkale Martyrs' Memorial at Morto Bay, Cape Helles (near S Beach), the Turkish Soldier's Memorial on Chunuk Bair and the memorial, and open-air mosque for the 57th Regiment near Quinn's Post (Bomba Sirt). There are a number of Turkish memorials and cemeteries on the Asian shore of the Dardanelles, demonstrating the greater emphasis Turkish history places on the victory of March 18, over the subsequent fighting on the peninsula. The significance of the Battle of Gallipoli is perhaps most strongly felt in Australia and New Zealand where it was the first great conflict experienced by those fledgling nations. Before Gallipoli the citizens of these countries were confident of the superiority of the British Empire and were proud and eager to offer their service. Gallipoli shook that confidence, and the next three years on the Western Front would damage it further. The ANZACs were revered as heroes, and in Australia as a typical depiction of the toughed Australian character, betrayed by the inadequacies and callousness of their British superiors, impressions re-affirmed in young Australians by films such as Peter Weir's Gallipoli. Popular Australian history asserts that while the Federation of Australia was born in 1901, the country's true psychological independence was only achieved at Gallipoli. ANZAC Day is commemorated every year on the landings' anniversary, on April 25, and is a national holiday in both Australia and New Zealand. In Turkey, the battle, known after the port of Canakkale, where the Royal Navy was repulsed in March 1915, has become part of the legend of the nation's revered founder, Mustafa Kemal Ataturk. More widely, the battle is regarded as a symbol of military incompetence and catastrophe. The anti-war song "And The Band Played Waltzing Matilda," written by Eric Bogle, is about the campaign. ↑ FirstWorldWar.com, The Dardanelles Commission. Retrieved September 15, 2007. ↑ Robert Fisk, The Great War For Civilisation; The Conquest of the Middle East (London: Fourth Estate, 2005, ISBN 9780007203833), p. 394. ↑ Les Carlyon, Gallipoli (Pan Macmillan, 2001), p. 314, 515. ↑ Diggerhistory, Gallipoli. Retrieved September 15, 2007. ↑ Cemalettin Taskiran, Allied Attacks On Turkish Patients & Wounded, Journal of the Turkish Weekly. Retrieved September 15, 2007. ↑ Commonwealth War Graves Commission, Cape Helles Memorial to the Missing. Retrieved September 15, 2007. Gilbert, Martin. The First World War: A Complete History. New York: H. Holt, 1994. ISBN 0-8050-7617-4. Haythornthwaite, Philip J. Gallipoli 1915, Frontal Assault on Turkey. London: Osprey Publishing, 1991. ISBN 9781855321113. Hickey, Michael. Gallipoli. London: J. Murray, 1995. ISBN 9780719555503. Tyquin, M. Gallipoli: the Medical War. Sydney: University of New South Wales Press, 1993. ISBN 9780868401898. Five Months at Anzac, by Joseph Lievesley Beeston. This page was last modified on 14 November 2017, at 17:37.